I couldn’t wait to show Kendall the Guinot Skin Care headquarters in Paris. I studied and visited with Rene Guinot in the beginning of my career in skin care. The founder of Rene Guinot was a chemical engineer, and a well known chemist who began working with skin care products in the late 1920’s. Guinot’s chemistry background allowed him to approach the skin and beauty care market from a scientific viewpoint. In 1930, Guinot achieved his first breakthrough by recognizing that deep cleansing the skin allowed the active ingredients in skin care products to penetrate more deeply. He was one of the first pioneers in skincare to add active ingredients in his products. Over the next several decades, Guinot built up a list of more than 55 biologically active ingredients that could be used to treat various skin types. Guinot also began experimenting with the use of electricity as a means of stimulating the action of the different substances incorporated into his gels and creams. These innovations were supplied to his wife, who was an esthetician. She used them in her own Parisian SkinCare Salon. By the early 1960’s Guinot’s formulas had begun to attract interest from other spas in Paris. 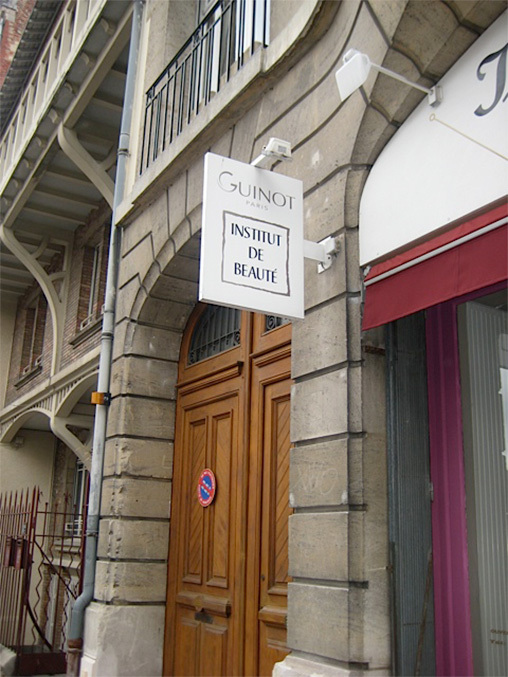 The Rene Guinot Company was started with 22 salons in France. In 1965, Guinot had succeeded in his first breakthrough treatment, which he called “Hydradermie”. The use of special gels applied with the aid of roller electrodes. This is the same treatment used today all over the world at exclusive spas. I’ve been doing this special treatment for 35 years, and it’s still one of the most gentle, thorough, hydrating and effective treatments in the world. It is the most popular treatment before plane travel or vacations. 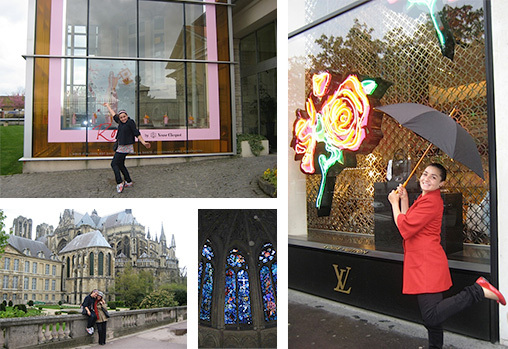 Of course, we couldn’t leave France without visiting Eperney, Reims and the Champagne Region. I wanted Kendall to see Chagall’s beautiful stained glass windows, and show her how Champagne was made. Remembering my experience on visiting this region in the 80’s was fascinating and I wanted her to see that part of France. I also wanted to give her that first sip of champagne. One of my favorite artists is Chagall and in Reims, France is the beautiful Notre-Dame Cathedral. In 1974, Marc Chagall created three stained glass windows for the axial chapel of the Cathedral, they are beautiful. Those windows inspired me to learn the art of stained glass and it became a hobby of mine. We toured Verve Clicquot. We learned about the fascinating blend of winemaking, and biography of the remarkable woman, Madame Clicquot Ponsardin, who transformed champagne into a global industry back in the 19th century. We toured Moet & Chandon, and Kendall’s first sip of Champagne was Don Perignon! Even with one week, we barely scratched the surface of Paris. It’s a huge city that takes a lifetime to really see. Our trip ended with lunch at Laduree, a bakery that opened in 1862 by Louis Ernest Laduree. The Parisian cafe and pastry shop was one of the first tea rooms in Paris. After looking at all the beautiful colors of the macaroons, we scooped up a few dozen for our trip home. Oh, and a quick stop at Reppetto, to pick out a pair of french ballet slippers for my girl…she chose red! To take Kendall to Paris and watch her skip from one Parisian sight to another, and see the city through her innocent eyes was a dream come true, and one I will cherish forever. Our week in Paris was sunny and perfect, an hour before we left it started raining. It was magical. This is the spirit that I always follow and hope that you nurture your beauty within. 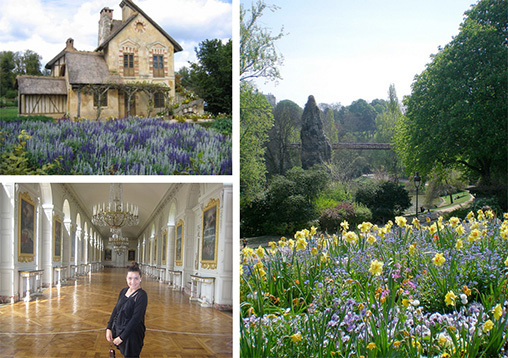 Paris in the month of April dances with fragrance and flowers. The glorious colors of tulips, daffodils, cherry and apple blossoms among other varieties of flowers are everywhere. All we wanted to do was relax and enjoy each fleeting moment, holding on to the unique ambiance for as long as it would last, but we had too much to do and see. On our first morning we walked down the Champs-Elysees and through the Jardin Des Tuileries. We visited Notre Dame and its Bell Tower. We had so much to do in such a short time, and we could feel the energy of Paris combined with our excitement. First on our list was showing Kendall the Louvre Museum, the central landmark of Paris, France. It’s one of the worlds largest museums and a historic monument. Showing her the Louvre, watching her admiring the masters and sharing which ones she liked the most was wonderful. With over a million pieces of art, you could spend a month in the Louvre and still not see everything. We had a wonderful tour guide who showed us the main works of art, such as the Mona Lisa, Venus de Milo, Winged Victory of Samothrace, Davids’s Coronation of Napoleon, and much more. We saw the Louvres’s incredible collection of Egyptian art and Greek Sculpture. A tour of Napoleon lll’s private apartments was a perfect way to end our tour. It gave us a rare insight itno the privileged lives of the emperor and empresses who ruled France over a period of 23 years. We visited the Musee D’Orsay and she loved the great artists Degas, Monet, Manet, and Van Gogh. A trip to the Palace of Versailles, located outside the city was something I certainly wanted Kendall to experience. We spent a whole day exploring the palace, learning about the gardens and Marie Antoinettes’s Estate. Versailles is probably the most famous example of architectural bling in history, and the elaborate gardens that surround the palace are masterpieces of design: flowerbeds with precision cut hedges in the form of flor-de-lys, manicured lawns, trees pruned and contorted into seamless geometrical shapes, and golden cascading fountains. These are just a fraction of the startling things to be seen at the Palace of Versailles. I’ll share with you my love of french skin care (and champagne) in my next blog.